and divide by p to find the period. The variable h is the horizontal shift, and v is the vertical shift. This function tells you that the period is twice as fast but that the horizontal shift is actually pi/2 to the right. Write the equation in its proper form by factoring out the period constant. Graph the original cosine function y = cos x as you know it. This graph has an amplitude of 3, but the negative sign turns it upside down’. The range is now [–3, 3]. You can see the amplitude change in the figure. Changing the amplitude to 3. Since the coefficient is –3, the graph is also turned upside down. which you can see in the figure. Changing the period to 4pi. One cycle of the graph now goes from x = 0 to x = 4pi. This shift is shown in this figure. A horizontal shift to the left. 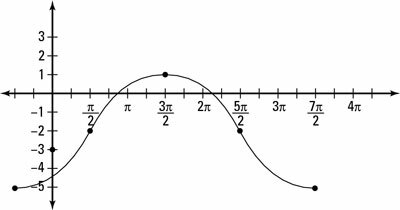 One cycle of the graph now goes from x = –pi/2 to x = (7pi)/2. Because of the – 2 you see in Step 1, this graph moves down two positions, which you can see in this figure. State the new domain and range. The range of the graph in the figure has been stretched because of the amplitude change, and shifted down. To find the range of a function that has been shifted vertically, you add or subtract the vertical shift (–2) from the altered range based on the amplitude. For this problem, the range of the transformed cosine function is [–3 – 2, 3 – 2], or [–5, 1].